Located in Gainesville, FL and found right in the middle of their busy college campus. 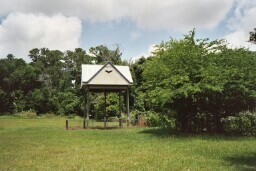 This Bat house was built because Bats were found in one of the campus buildings, and the Bats needed to be removed. This house was built for a cost of around $20,000.00. It had to be structurally sound, and made to go through hurricane winds. It is found across from a lake area where there is parking for about 15 cars. Then one only has to cross a one lane street, and then from the sidewalk one can view this house. People come nightly to view the Bats leaving. Even though the removed Bats were placed in the house they were gone the next night. It then took about three years before the Bat House was used. I believe there are now 250 thousand Bats, and it will hold 500 thousand. Note: I need to check out these figures for you. This is the view from the sidewalk. There is a fence to keep people from walking up to the house. 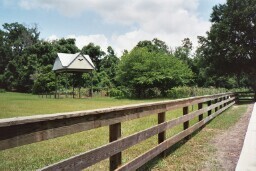 There is also a fence around the Bat House area. HOW COULD YOU NOT LOVE THEM! Most people believe bad things about Bats. These ideas probably came from our days of watching Count Dracula movies with Vampire Bats attacking people. Or, we have heard of people getting bitten from picking up a bat found on the ground. Education really is the key to understanding everything in life. And it should be no different with bats. Read and learn about their part in our World. Yes, there is such a thing as a Vampire Bat that does drink blood. This type of bat is found down around Mexico, and in some Texas areas. The bat makes a small bite on a cow, and then peacefully laps up the cow's blood. The cows do not seem to mind so much, but it does make them a bit weaker, and would be better for the cow's health if these bats would not bit them. Then yes, people do get bitten by bats, but these are bats ones they have found on the ground and picked up. Now if we knew, that if a bat is healthy you would never but never, find it on the ground. So, only sick bats are found on the ground. Do they carry rabies? Yes, they could carry Bat Rabies. Just like dogs could have Dog Rabies, and Raccoons could have Raccoon Rabies. 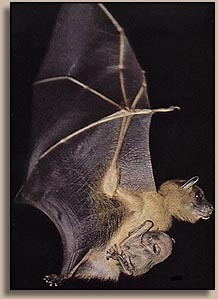 If a bat is on the ground it is sick, and if it has rabies it will soon die. So you will not catch rabies, unless you try to pick it up, nor will the sick bat be giving rabies to other bats. All bats do not normally have rabies, only a very small percent carry rabies. Just like you probably would not pick up a rattlesnake, do not pick up a bat on the ground. If you do have a Bat Rescue close to your area contact them to come and help the down bat. Also bats swooping around are not trying to go after you, or want to get into your hair. They are following the sound of bugs to eat. 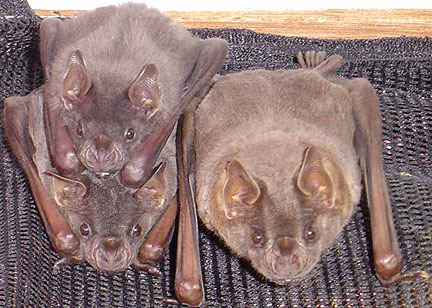 There are 17 types of bats found in Florida, and about 40 types in the United States. Each type of bat helps nature in their special way. Do read bat books, or watch bat videos/CD's. Yes, you have heard they eat tons of bugs each night, traveling for hours and miles and miles. But did you know that most of the fruits and vegetations were started by bats? They eat continuously, and every 20 minutes eliminate seeds of what they are eating. Those seeds drop to the ground and eventually start to grow, which could be miles away from the original plant. That is why their are so many different kinds of bats. They are our biggest pollinators of plants and fruits. Take notice of their different shapes and sizes. Such as, a long tongue to reach deep into a flower to get nectar, but at the same time they get their face covered with pollen. The next flower they go to getting nectar they then pollenate the plant leaving the pollen from their face from the last plant. Read and learn more of what they do for us. We need them to continue to live the good lives we have. Bats need our help in making new homes for them, and you can help. Make a difference. Read, learn, and then put up a Bat House! NOTE: Christy's Bluebird Project is not all about Bluebirds or Bats. As we help our particular land area, we have the opportunity to help our whole community. I like to think that each of us are making a difference in our North American Continent. Yes, each of us makes a difference! Note: The above list did have photos, but are now unavailable from the site, that I first found them from. BAT INFORMATION - A little bit of good info. BAT CONSERVATION INTERNATIONAL - A great site to see what is happening with Bats all over the World. BAT WORLD SANCTUARY - Large organizational site. BUZBEE'S BATS - Jim put together an accumulation of Bat information from everywhere. Amazing quanity! Note: He even mentioned our site! FLORIDA BAT CONVERVANCY - A Florida Bat site. VIDEOS OF BATS - UTube - Home made movies.